The vacant Celtic Bantamweight Title was on the line on Saturday at the Lagoon Leisure Centre in Paisley, Scotland in an event promoted by Saltire Boxing Promotions. The title fight would see local boxer Gary Rae (8-1) take on Lanarkshire’s Scott Allan (9-3-1). The first round was largely a feeling out round until Rae landed a good right hand that pushed Allan up against the ropes. In the second round, Allan ended the round on top with Rae taking a few heavy punches, Rae looked as if he felt the punches when the bell went. As the fight went on Allan was able to land the cleaner more concussive shots, getting inside Rae’s jab. 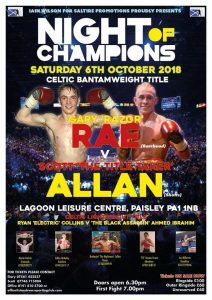 After the 10 rounds, the large Rae support were to be disappointed as Allan won decisively, 97-93, 98-93 and 98-92 to become the new Celtic bantamweight champion. The Celtic lightweight title was to be up for grabs in the bout between Ryan Collins (13-3-2) and Ahmed Ibrahim (7-2-1) however Ibrahim failed to make the weight, coming in 4lbs heavier, meaning only Collins could win the title. The early rounds were pretty close, with Ibrahim looking to land the power punch while Collins was utilising his jab. Ibrahim would be down in the 3rd, when he claimed he slipped however the referee deemed it a knock down. This seemed to motivate Ibrahim as he came out throwing in the 4th round and landed a beautiful right hand which put Collins on the canvas. Collins looked like he had recovered however the referee wanted the doctor to check his damaged eye before round 5, the referee decided to stop the fight. It was an entertaining fight while it lasted however the Celtic lightweight title remains vacant. On the undercard, a couple of highly rated amateurs made their debuts, both winning. Two times amateur British champion Craig Morgan had an impressive debut winning 40-35, after landing a great upper cut and showing good movement against Adam Hutchinson. Nathaniel Collins, competed in the Commonwealth Games in Gold Coast, Australia, earlier this year, representing Scotland, he had a comfortable pro debut beating Lee Connelly 40-36. Scottish super featherweight champion Jordan McCorry (17-3-1) opened the show and made light work of Reynaldo Mora from Barcelona, stopping Mora in the second round in the lightweight clash. McCorry was landing at will and had Mora down early in second round, Mora continued but it was more of the same from McCorry and the ref stepped in to stop the fight. Scott Allan beat Gary Rae (97-94, 98-93, 98-92). Ahmed Ibrahim beat Ryan Collins RD5 referee stoppage. Craig Morgan beat Adam Hutchinson 40-35. Called McCauley beat Angel Emilov 59-56. Nathaniel Collins beat Lee Connelly 40-36. Martin Harkin beat Chris Jenkinson RTD RD2. Kristen Fraser beat Rozmari Silyanova RD 7 referee stoppage. Jordan McCorry beat Reynaldo Mora RD 2 referee stoppage.